"In time so long ago begins our play, "
"In clash-strewn galaxy far, far away." To Shmi or not to Shmi? Torn between duty to the Jedi, attraction to Padme, and concern for his beloved mother, yeoman Jedi Anakin Skywalker struggles to be master of his fate. The path he chooses will determine not just his own destiny, but that of the entire Republic. And thereby hangs a tale. Alack the day! A noble lady in danger. A knight and squire in battle. And a forbidden love that s written in the stars. 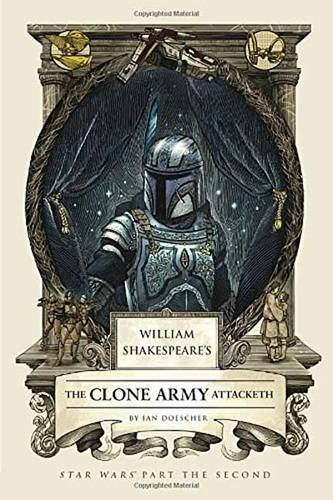 Once again, the quill of William Shakespeare meets the galaxy of George Lucas in an insightful reimagining that sets the "Star Wars" saga on the Elizabethan stage. The characters are familiar, but the masterful meter, insightful soliloquies, and period illustrations will convince you that the Bard himself penned this epic adventure."